Today I'm going to share a quick and easy last minute present that is sure to please, inspired by the very popular game Angry birds. 2. Sc starting from the second st from crochet hook, sc the rest of the row. Total = 11 sts. 3. Ch 1, turn, sc 11 sts. Total = 11 sts. 4. Repeat row 3, 13 times. Total = 11 sts. 5. Cut off leaving a long tail for sewing. 1. Ch 6 sts, to form loop. 2. 2 Sc into each st. Sl st on last st. Total = 12 sts. 3. Cut off leaving a long tail for sewing. 2. Sc starting from the second st from crochet hook, sc the rest of the row. Total = 7 sts. 3. On the last st ch 8 sts, turn and repeat row 2. Total = 14 sts. 4. Connect both rows you just created by making a sl st in the middle of the first row you made. Total = 14 sts. 3. Sc 12 sts. Total = 12 sts. 4. Cut off leaving a long tail for sewing. 4. Repeat row 3, 2 times. Total = 11 sts. 5. Make 2 dec, sc 3 sts, 2 dec. Total = 7 sts. 6. Ch 1, turn, 1 dec, sc 2 sts, 1 dec. Total = sts. 7. Cut off leaving a long tail for sewing. Arrange all of the parts according on one of the red piece and sew. Sew the brown body, then the beak, then eyebrows, and lastly the eyes. I found this way was the easiest. Now sew both of the red pieces together and you are done! 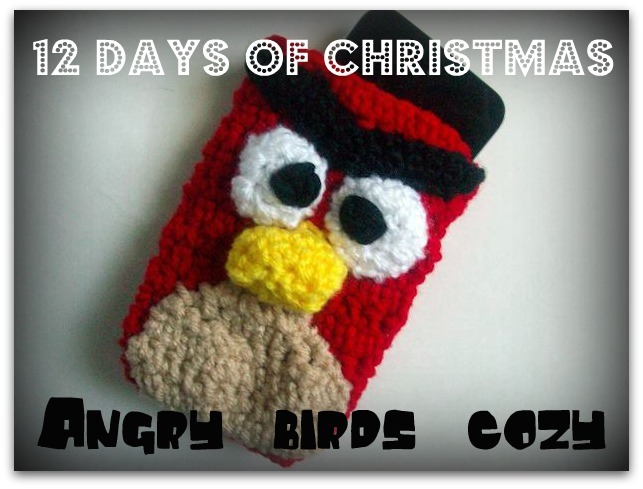 This cozy makes a great gift for anyone who is a fan of the game Angry birds. Plus this cozy only takes about an hour to make. I hope you enjoyed this DIY. Is this sized to fit a phone? My youngest is getting a tablet for Christmas and would love this! I can tweak it to fit. You did great! It's super cute! This is just awesome! All of my 20-something kids absolutely LOVE the Angry Birds and this is the perfect last-minute gift! Thank you so much for sharing! if i make this, can i sell the thing i made? I wouldn't really appreciate it if you did. You can give it as a gift instead. I may start selling some of these cozies in my shop, so if someone wants to buy one tell them about my shop.